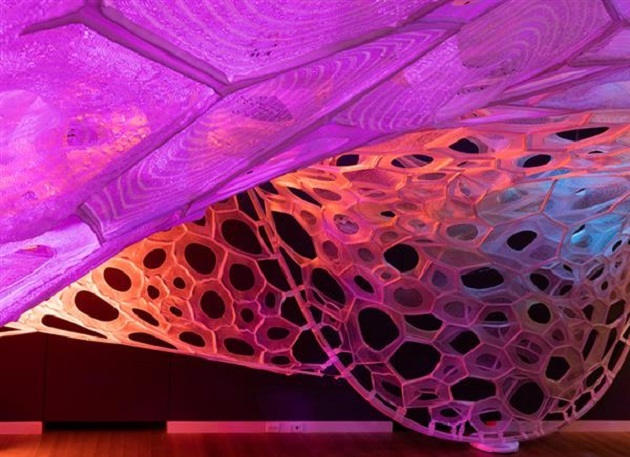 A luminescent web in different colors was presented at the Smithsonian Design Museum in New York. It was created by Jenny Sabin Studio that makes use of glowing and solar active threads which absorb and give off the light in various patterns. It was made possible because of parametric thread and the use of 3D printer. Jenny Sabin Studio is based in Philadelphia and focuses on experimental architecture design. Sabin was known in the fields of art, architecture, and science wherein she applies biological theories and mathematics in creating unique designs. She is a director of the Sabin Design Lab, a professor in the university, and has also worked with famous and reputable clients. Sabin designed the PolyThread Knitted Pavilion for the exhibition area in New York. She had already created a Pavilion which was commissioned by Nike last 2012 wherein she combined biological data to 3D printing technology. She came up with interwoven structures that look digitally knitted similar to the performance enhancing shoe of Nike. She then applied the same approached when she created the PolyThread Knitted Pavilion. This is considered as the largest work in the exhibition. Sabin started the pavilion by crafting the 3D model as she depends on art and math in order to generate a skeletal structure. The 3D model is made up of nylon material to be assured that it is lightweight and durable. On the other hand, the 400 square ft. textile pavilion was made up of aluminum tubing, twill tape, and yarns that are photo-luminescent and also light-activated. The total weight of the fabric is 100 pounds. The most important part of the pavilion that gives live to the structure is the digitally 3D knitted yarns. They absorb the light that is coming from the sun and releases rhythmic and multi-colored patterns. The effects were enhanced because of its night and day cycle that will take a 15-minute loop. Creating prototypes for outdoor installations is possible because the pavilion is lightweight and easy to move. This will allow the structure to acquire sustainable and natural light from the sun that electricity cannot provide. 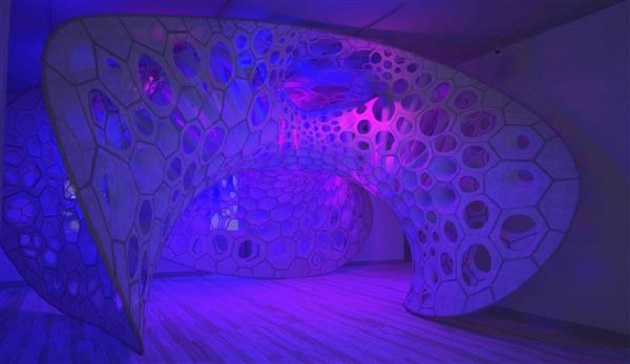 The pavilion is displayed and also the fifth installment of Cooper Hewitt Design Triennial with a theme “Beauty”. The exhibition presents over 250 works from 63 international designers. 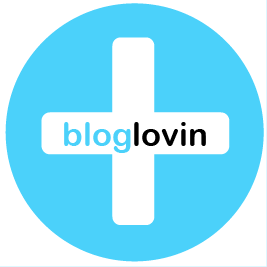 It is divided into seven categories that include intricate, emergent, extravagant, elemental, ethereal, transformative, and transgressive. Though the 3D pavilion of Sabin tries to represent almost all of the elements, it belongs to the “Emergent” category because it combines technology and digital approach in creating the structure. There is another 3D printed structure of Sabin that will be displayed, which is called Polybricks. It is an architectural system that is 3D printed designed for building large structures. It has 3D printed bricks that are made up of cost-efficient materials and digitally customized tools. Similar to Sabin’s works, this structure aims of introducing a new way on how people can combine structures and bodies with technology. 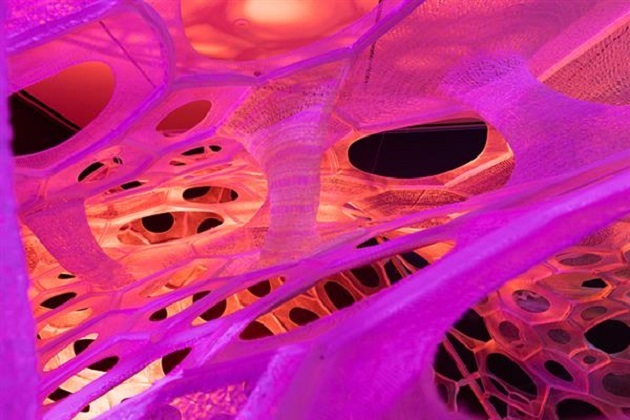 There are two innovative 3D designs that are added in the Emergent sector created by Olivier Van Herpt and Neri Oxman.